Monarch Air Group provides private air charter in Orange, New South Wales, Australia. Our clients benefit from top-notch service, unrelenting dedication to safety, wide selection of aircraft, and years of experience in chartering private jets. To obtain a free quote, please use our online quoting tool provided below, or call toll free 1-877-281-3051. Monarch Air Group provides private jet charter flights in and out of Orange, New South Wales, Australia. Orange is a beautiful city in the Central West region of New South Wales. The city is situated 128 mi west of the state capital – Sydney. The population of Orange is about 39,329 people. The city’s economy is mainly based on mining, agriculture, education and health services. Orange is the birthplace of such poets as Kenneth Slessor and Banjo Paterson. The most popular tourist attractions include Anzac Park, Cadia Mine, Borenore Caves, Cook Park, Duntryleague Golf Club and Clubhouse, Historic Centre of Orange, Orange Botanic Gardens, Robertson Park, and much more. 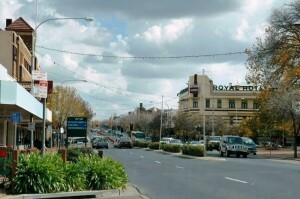 The city is served by Orange Airport (OAG / YORG), which is located 18 km from the city center, and Bathurst Airport (BHS / YBTH), which is situated 66 km from Orange. 1. BHS, Raglan, Bathurst, Australia. 2. CUG, Cudal, Cudal, Australia. 3. CWT, Cowra, Cowra, Australia. 4. DGE, Mudgee, Mudgee, Australia. 5. FRB, Forbes, Forbes, Australia. 6. GFE, Grenfell, Grenfell, Australia. 7. OAG, Springhill, Orange, Australia. 8. PKE, Parkes, Parkes, Australia.